Haegele Nursery is a family-owned and -operated local plant nursery, serving the greater Saint Louis area since 1986. We proudly bring local customers the largest selection of perennials, shrubs, trees, bushes and other foliage, as well as all the landscape materials you need to transform your lawn and garden. Visit today and don’t forget to ask us about our landscape services! Our nursery is packed with diverse options including flowers, shrubs, trees, grasses and bushes. You won’t find a selection this vast anywhere else! Contact us for materials delivery, including rock, mulch, sand, gravel, soil and more. We also deliver larger foliage wherever and whenever is convenient for you. The difference between a bland landscape and one brimming with life and color is immediately apparent. When it comes to your property, make sure people see the latter! And, when it comes to finding a diverse array of flowers, shrubs, bushes, trees and grasses, there’s no better destination than Haegele Nursery. 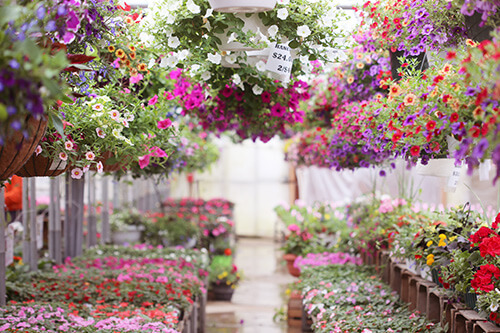 We’re a complete garden center in St. Louis, MO, dedicated to helping you take your property to its highest potential. Our plant nursery in St. Louis, MO is vast, with numerous options to ensure you’re creating the perfect tone for your property. Whether you prefer bold perennials that bloom vibrantly or you want a mixture of shade trees and flowering shrubs, we promise you’ll find healthy, well-tended plants here. In fact, you’ll find so much more—including the friendly advice and seasoned knowledge you need to make sure you’re taking home the right plants. We can even help you design the landscape you’ve always wanted, and we’ll be happy to install and maintain it. Call on us to build you that perfect garden, craft a luxurious hardscape, install eye-catching features and, of course, plant verdant foliage throughout. We’ll bring it all together in a stunning, picturesque landscape that’s unique to your home. 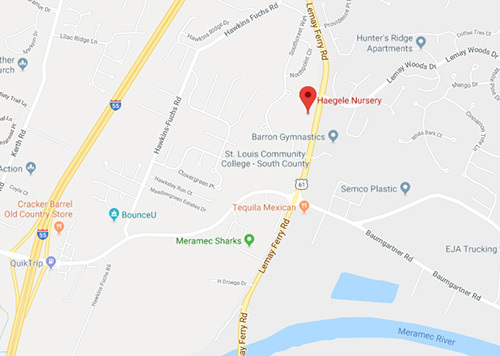 With both retail and wholesale gardener supply in St. Louis, MO, Haegele Nursery is the premier destination for all things involving plants and greenery. Stop by today and take home the plants that will transform your landscape—or, put in an order and let us deliver them to you! We promise, you’ll love the way our flowers and other foliage transform your property. We strive to maintain our affordability, so that anyone can come to us and find the landscape products or services they need. We’ve been a family-owned and -operated company since 1986. We pride ourselves on our experience and knowledge, and we’re always willing to pass it on to customers. We sell our plants retail, as well as wholesale. We’re a trusted distributor for landscapers and aim to be your partner for complete landscape products and materials. Take your garden to the next level or refresh your landscape with optimal appeal! Stop in or call Haegele Nursery today for greenery, landscape materials and the friendly expertise needed to put them to work.